Categories: Artwork Submissions, Contests and Giveaways, Holidays, Stamping. Tags: cards, Contest, creative, Giveaway, Holidays, Inspiration, Magazine, The Stampers' Sampler, Valentine's Day, Valentine's Day Cards. My favorite card is “Love Is” by Kim Ross. I pinned it here, http://www.pinterest.com/pin/63331938486052146/. I love the music note paper, white space, bird, heart, and shabby ribbon used on the card, along with the layout of the card. Just lovely. Would love to win a copy of Stampers Sampler. Awesome magazine, I pick it up frequently. I can tell that all examples are just wonderful! my favorite is Kim Sears…liked that she used a stencil and stamped the heart in black. I picked Love Garden b/c I liked the playful, casual look. That’s the link to my pin. Reminds me that you have to catch your love or at least look for it. My pin: http://www.pinterest.com/pin/7036943144048114/ I really like the orange and purple combination. Not your traditional valentine. I choose the card by Kim Ross & call it Songbird of Love. Cards that can be used for ANY occasion are my preference, and this one is sweet, optimistic and conveys a sweet song of ♥ Love! I chose Love Garden. Love does make everything brighter and more beautiful! I chose Passport to Love by Shari! I absolutely love that birdie in a heart and the musical notes paper! This card makes me want to go and make one right now!! 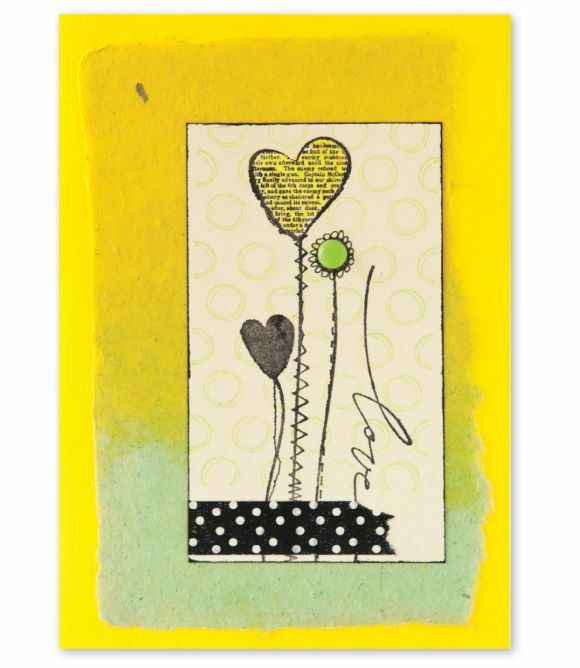 I just love the whimsy and random artsy feel of Love Garden by Shari Frost-Job!! I love the red, orange & purple instead of the traditional pink & red & white Marge McGuire’s ‘Grace’. A throw-back to my ‘inner hippee’ for sure! I like the graphic design and cheery color against the black and white elements on this card. I also like Sincere Feelings by Marge McGuire, but the wasn’t able to pin that one- the link takes you to the card displayed above hers. You should fix that, Marge deserves to have her art pinned too. Thank you for the giveaway! I liked this one because i Love this color scheme, its always been one of my favorites. I love the warm colors colors contrasted with the cooler purple, the wonderful beads and wire, and the rough painted corrugated paper. I pinned Passport to Love with its many textures, subtle colors and use of music. I pinned Be My Valentine by Kim Sears. I love the stenciling in the background! The colors are great and the black heart really pops. I like the bright, cheery yellow and the fact that it is a really different choice for Valentine’s Day! I love Passport to Love here http://www.pinterest.com/maryw0070/everything-somerset-/ I love everything about the card-from the rubber stamp to the color of the ribbon. It all works together perfectly. I finally started a board to put some of the things I love about Somerset–whats not to love!!! Great split complement color balance, texture, matte, sparkle, feeling; so much happening in one small space! While I think all the cards are beautiful, I love blues and greens. My fave is Sincere Feelings. I picked this Card because I LOVE Birds and it is Unique!!! Combining orange and purple with the traditional red makes this Valentine just shout happy! The layers of collage and the wonderful springy embellishment makes me want to run into my studio and play. This was my hands down … no competition favourite. It kind of looks like a mixed media piece. under Cindi Hoppes, you will see that I pinned. I chose Kim Sear’s Be My Valentine. I love the simplicity of it and the bright yellow! I pinned Love Is by Kim Ross. I love the colour scheme and how simple and clean it looks. here is where i pinned my favorite. I just LOVE “be my valentine” by Kim Sears! It is so colorful and pretty,and the black heart is sophisticated with the pink ribbon. Just lovely…such a HAPPY card! I love the simplicity of this card-and yellow is my favorite color. I’m using a Kindle so I don’t have a copy and paste feature. I copied the website by Hand: http//www.pinterest.com/pin/444660163184020056/ Hope I did that correctly. I forgot to say why I like the card I pinned. The blue heart in words stamp. I really liked the sincere feelingsbetter but couldn’t get that image to pin to the board. I love blue in all it’s hues and shades so that’s why I chose the cards. https://www.pinterest.com/pin/510806782711254528/ I love this card. Sometimes less is more. This card is very elegant,the verse is beautiful and the simplicity of the design only adds to the power of the sentiment.